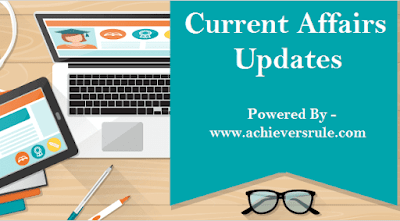 Achieversrule Team have brought to you the current affairs updates for 22nd and 23rd January 2018. All the important news on National Affairs, International Affairs, Agreements, Conference and Awards and Honors have been listed out here. These are sorted out and are very important for the upcoming Bank exams, SSC exams and Railway exams. The Raipur Municipal Corporation in Chhattisgarh organised the three-day Kachra Mahotsav 2018, India's first Garbage Festival, from Friday to Sunday. The festival aimed to increase awareness, use the waste generated in the city creatively, and to showcase multiple techniques for reusing things that are labelled as garbage. The event had workshops, talks, and performances. “Chenoy had been the Managing Director and CEO of the National Skill Development Corporation (NSDC), Director General (DG) of SIAM and Deputy DG of CII,” FICCI said in a statement. Senior IPS officer Sudeep Lakhtakia has been appointed as the new Director General (DG) of the 'black cats' commando force NSG. An order appointing the 1984-batch Indian Police Service (IPS) officer of the Telangana cadre was today issued by the Appointments Committee of the Cabinet (ACC), headed by Prime Minister Narendra Modi. The Union Law Ministry on appointed seniormost Election Commissioner Om Prakash Rawat as the next Chief Election Commissioner (CEC) as the incumbent A.K. Joti will retire. Former Finance Secretary Ashok Lavasa was appointed as Election Commissioner to fill the vacancy created by Mr Rawat’s elevation. Madhya Pradesh High Court Chief Justice Hemant Gupta administered the Oath of Office to the former Gujarat Chief Minister at a ceremony held at the Raj Bhavan. Silver jubilee of India-ASEAN partnership is being celebrated in New Delhi on the 25th January with an unprecedented summit meet. Monday saw the India-ASEAN Business and Investment meet and Expo being held in the national capital. Addressing the event, Commerce Minister Suresh Prabhu said that Prime Minister Narendra Modi is going to undertake several new steps in the fields of business and investment under the Act East Policy. The focus is on boosting trade through connectivity using the land route. India is projected to grow at 7.4% of its gross domestic product (GDP) in 2018 as against China’s 6.8%, the International Monetary Fund (IMF) said Monday, making it the fastest growing economy among emerging economies following last year’s slowdown due to demonetisation and the implementation of goods and services tax (GST). The findings come as a big booster for Prime Minister Narendra Modi who will meet international investors on Monday and Tuesday in a bid to get more investment into the country, especially in the manufacturing sector, which has remained sluggish and is crucial to job creation. The first Post Office Passport Seva Kendra (POPSK) of Puducherry was inaugurated by Smt. Sushma Swaraj, Minister for External Affairs at Karaikal. China adds 24 GW in just two months making it biggest producer of solar energy. Renewable energy use is increasing day by day almost everywhere. Sri Lanka restricted the import of the vehicles which do not carry airbags for driver and front seat passenger, Anti-Locking Braking System standards (ABS) and three-point seat belts for driver and passengers traveling front and rear seats. Accordingly, the importation of motor vehicles, which are below emission standards of the Euro IV or its equivalent and not complied with the following safety standards, will totally be prohibited effective from 1st July 2018. Valletta has been officially inaugurated as the European Capital of Culture. Over 140 projects and 400 events have been planned in 2018 around three main themes: Island Stories, Future Baroque and Voyages. The Telangana government said it had signed a Memorandum of Understanding with the Clean Authority of Tokyo in connection with municipal solid waste incineration. "The government of Telangana and Clean Authority of Tokyo have signed an MoU for municipal solid waste incineration facilities. According to the release, a Telangana business delegation to Japan, led by IT and Industries Minister KT Rama Rao, met industrial heads and leaders of multinational companies in Tokyo. The Andhra Pradesh Government and the Canton of Zurich on Monday signed a letter of intent, to promote mutual prosperity and development. The 2018 edition of the Women’s World T20 will be hosted by Antigua and Barbuda, Guyana and St Lucia from November 9-24. Hosts Windies will defend the title they won with an eight-wicket victory over Australia in Kolkata in 2016. Stafanie Taylor, who was named as captain of the ICC Women’s T20I Team of the Year 2017, won the player of the series award in India and is expected to once again lead the Windies in front of a passionate home crowd. Members of the Hindi film industry came together to celebrate the best of Bollywood in the year 2017 at 63rd Jio Filmfare Awards 2018, held on January 20 at the NSCI Dome in Worli, Mumbai. The starry night was hosted by Bollywood's Baadshah Shahrukh Khan, and his good friend and filmmaker Karan Johar provided him some company on the stage. Young Indian shuttler Siddharth Pratap Singh secured his maiden international title, bagging the Swedish Open Junior International Series with a straight-game victory over Denmark's Mads Christophersen in the finals . Playing his first career final, Siddharth defeated Christophersen 21-15, 21-11 in a 33-minute match to claim the men's singles title on Sunday. Shah Rukh Khan receives Crystal Award at World Economic Forum.